It’s fall and that means one thing to a lot of people in this country—football! True grit on the gridiron not only stirs passion from spectators, it contributes to a multi-billion dollar sports industry in the United States. According to Plunkett Research®, Ltd., sports, with football at the top, is big business. “Combined, the ‘Big 4’ leagues in America, the National Football League (NFL), National Basketball Association (NBA), the National Hockey League (NHL) and Major League Baseball (MLB), bring in about $24 billion in revenue during a typical year, but that’s just the tip of the iceberg. U.S. sporting equipment sales at retail sporting goods stores are roughly $41 billion yearly, according to U.S. government figures. Yes, cheerleaders are part of this lucrative sports industry. NFL Cheerleading is a professional cheerleading league in the United States. Most of the NFL teams have a cheerleading squad in their franchise. Cheerleaders are a popular attraction that gives a team more coverage/airtime, local support, and increased media image. Think Dallas Cowboy Cheerleaders or their rivals, First Ladies of Football, Washington Redskins Cheerleaders. For the NFL, the Baltimore Colts was the first team in the NFL to have cheerleaders in 1954. These girls were also a part of the historic Baltimore Colts Marching Band. The only NFL teams without cheerleaders are the Chicago Bears, Cleveland Browns, New York Giants, Detroit Lions, Green Bay Packers, and the Pittsburgh Steelers. The February 2011 meeting of the Packers and Steelers at Super Bowl XLV was the first time a Super Bowl featured no cheerleaders. The Packers do, however, use a collegiate squad from time to time in a limited role to cheer at home games. I was curious. Besides being able to hear the music and follow the beat, what other qualifications do you need to be an NFL Cheerleader? So, I went online as if I were going to apply to become a “Charger Girl,” the cheerleading squad for NFL’s San Diego Chargers. I got so excited when it said “Be a part of the Hottest Dance Team in the NFL! Charger Girls Audition.” Using my super-sized imagination, I went through the list of requirements to see if, by any slim chance, I could apply. Wow, this was sounding great. Okay, deal breaker, count me out. But, now I know that auditioning for this job is not for the faint of heart. I watched some of the auditions on the Internet to learn more about what is behind the women who are brave enough to try. You have to be talented, athletic, outgoing and more. One woman, Kei, came all the way from Japan just to try for this coveted role. 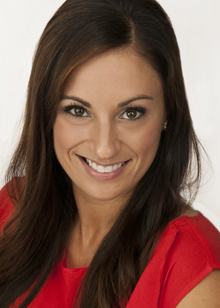 But there is one young woman who stands out among them all—Melissa Puleo Adams. She’s a tenacious, spirited girl, who caught the attention of ABC’s Good Morning America and who was interviewed on the program last year. By the way, Melissa happens to have a hearing loss. Now, she has our attention. Your hearing loss… when was it detected and was it treated? I was five when my hearing loss was detected by my kindergarten teacher. My teacher notified my mother that she noticed I wouldn’t turn around when called at times. My parents took me to an ENT to get my hearing tested and they discovered that I had a hearing loss in both ears. 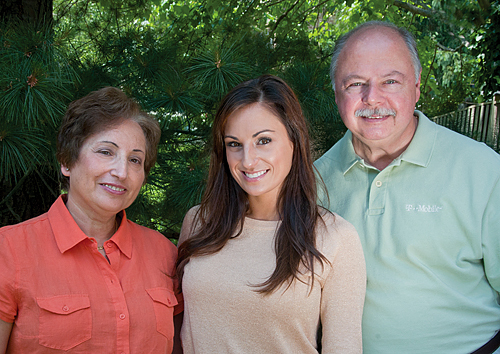 I was fitted with two behind-the-ear (BTE) hearing aids at age five. What about school, the classroom, friends? I was fortunate to have a pleasant grade school experience due largely in part to a great family support system, and a positive attitude. When I was first fitted with BTE hearing aids, I proudly wore my hair up with confidence, showing them off to all my friends and classmates. My friends all thought my hearing aids were ‘so cool’ and wanted to try them on and get a pair of their own. However, in high school and college I was shy, maybe embarrassed, about my hearing loss. I no longer told my peers about it and kept my hair down to cover my hearing aids. I always thought what guy would want to date a girl who wears hearing aids? I didn’t know anyone else with a hearing loss. This didn’t affect my positive outlook, although I’m sure having a friend to relate to may have helped during my high school years. In terms of teachers and school, I still continued to tell the teachers on the first day of class that I needed to sit front and center and that if they turned away from me to face the blackboard then I probably wouldn’t understand what they were saying. I did the same in college and talked to the professors after class if I thought I missed something. Speaking of college, how did you decide on your major when you had so much interest in dancing? When I first attended James Madison University, I had an undeclared major and had no idea what I wanted to do. As a freshman, I declared Business as a major because it felt like a suitable, broad option. Though I enjoyed my business classes, the artistic/creative side of me felt ignored. I decided on Media Arts and Design with a concentration in Interactive Digital Media. Classes consisted of graphic design, web design, communications, media, broadcasting and copywriting. This was right up my alley because I’ve always been creative. When I was little, I used to write stories and mini-books complete with pictures. I also loved making up plays and making my little brother, Marc, and our friends perform the parts I created for them in front of family and friends. Did you take dance lessons as a child? There must be a segue to wanting to become a Charger Girl. 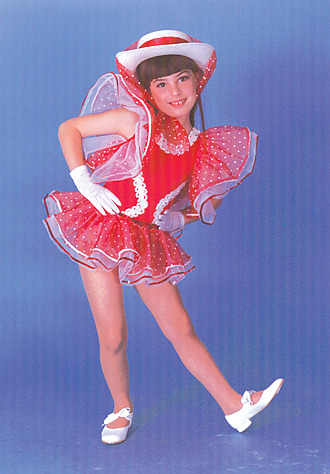 My mom put me in tap and ballet class when I was five (same time frame when my hearing loss was detected). I fell in love with it immediately and knew that I wanted dancing to be a part of my life forever. I have always been an avid exerciser but to prepare for the Charger Girl auditions, I took more dance classes on top of my usual cardio and weight-training routine. Taking dance classes not only helped me brush up on my skills, but also helped train my memory for learning choreography. When did you start thinking about becoming a Charger Girl? I’ve always had the dream of becoming a professional dancer when I started dance lessons. When I moved to San Diego from Maryland in 2005, I heard of the San Diego Charger Girl auditions. They have a great reputation of being a fantastic group of women and I wanted to be part of it. I first tried out for Charger Girls in 2005. The auditions are always held in March or April. My hearing loss made it more difficult for me because the auditions were in a huge auditorium with an echo. Once I got the dance routine started, I would be totally fine, but the main challenge was starting on the right beat. Sometimes I would use my peripheral vision to look at the girl to the right or left of me to see when to start. It is a vigorous audition process. More than 400 girls audition for a spot on a team of 28. There are preliminary tryouts first, after which they make two cuts. You learn choreography and then you must perform for a panel of judges in groups of three. About 60 girls make it to the final rounds which include a one-on-one interview, a group interview, and a final dance audition. You have to prepare a solo dance to showcase to the final judges as well. It is nerve-wracking but the adrenaline that pumps through you gets you through it! I didn’t make it. I tried out again in 2006. I didn’t make it. Again, in 2007. No, again. I tried again the next two years in 2008, 2009. No and no. That’s five tryouts. After one rejection, most of us would have moved on. For five years, after rounds of dance auditions and interviews, I had the same experience. All of us sit together holding hands, eyes closed, hoping to hear our audition number called. It’s an intense moment. The first five times my number was not called, it was tough. I had friends who would make the team and it would be a bittersweet moment. I was thrilled for them but I had to go home, year after year, not as a Charger Girl. Though it was hard not to make it, and especially not to know why you weren’t picked for the team, I knew this was something I could do well if given the chance. I was not giving up on my dream. Well, all I can say is: Hence, if at first (second, third, forth, and fifth in my case) you don’t succeed, try and try again. And, in 2010, what happened? My number was called after my sixth audition! It was one of the most memorable moments in my entire life. I waited six years to hear my number called! I’ll never forget that moment. Is life as a Charger Girl what you expected? I was a Charger Girl for two NFL seasons, 2010–11 and 2011–12. I had the most incredible experience and can say it was all that I expected and more. Some of the teammates I had will be my friends for life. The director, Lisa Simmons, is an amazing leader and I’m proud to call her a friend of mine. Now, what about your hearing loss? In June I became certified to teach barre3, a mixture of yoga and pilates, using a ballet barre. It’s a fantastic workout that tones your entire body, and the best part is that almost anyone can do it! Being an instructor poses a new challenge with my hearing loss, but as always I’m up for the challenge. I have a couple of other business ideas in the works I plan to unleash on the world in the future. I can’t share them quite yet. I also want to have a family down the road, but in the meantime, I am enjoying this stage of my life and embracing any opportunities that arise. Who or what is the most important to you? My family—without them I wouldn’t be the person I am today. Honestly, every day is a challenge. Little things such as listening to the radio in the car with the windows down, using the phone, jumping in the pool, aren’t as easy for me as they are for those with normal hearing. It’s all about your attitude. I just stay positive and cherish all the amazing things that I do have in my life, especially my supportive family and friends. To find out more about the Charger Girls, go to http://www.chargers.com/charger-girls/. 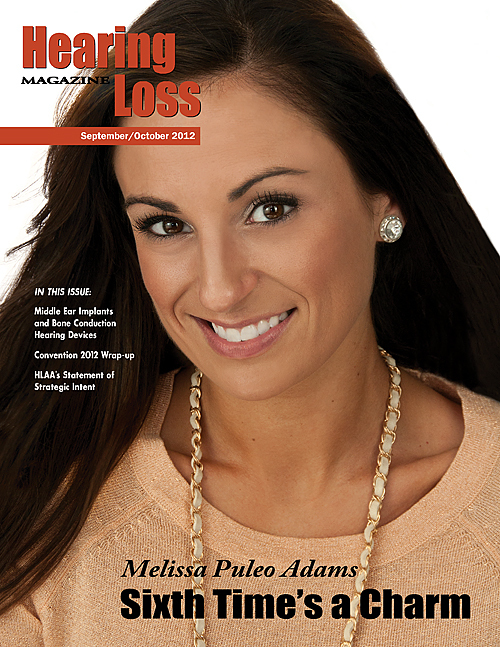 Melissa Puleo Adams can be reached at melissapuleo@gmail.com. Barbara Kelley is editor-in-chief of Hearing Loss Magazine and deputy executive director of the Hearing Loss Association of America. She can be reached at bkelley@hearingloss.org.